A narrow style window espag. 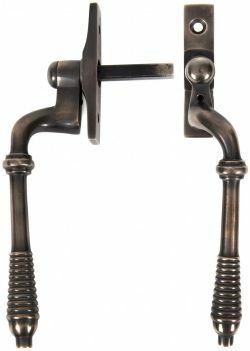 handle with stylish reeded end detail. Fits on any type of window, including uPVC and timber due to its slim fixing plate. The handle is cranked away from the frame and window to allow ease of use. Manufactured from unpolished solid bronze. Overtime and through use the solid bronze will slowly lighten in colour resulting in a beautiful subtle patine look. It can be fitted to any modern espagnolette system and can be locked with a grub screw on the handle. Sold complete with a 7mm thick spindle and supplied with necessary fixing screws. (Picture shows right hand handle).